For over 25 years, homeowners have been asking for Gutter Helmet® by name. The #1 Nose Forward Design extends to the edge of the gutter, eliminating all vertical openings. Gutter Helmet’s patented Textured / Ribbed Surface increases rain handling capabilities, tensile strength and is more attractive than flat panel knock-off’s. 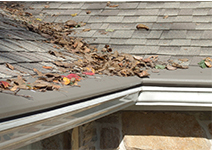 Gutter Helmet® includes a PermaLife™ coating that will not chalk or fade. Engineered to last a lifetime, Gutter Helmet® installs over new or existing gutters. Only Gutter Helmet® can rightfully say you will Never Clean Your Gutters Again®!